From Fasig-Tipton's 186 hips, 136 are broodmares or prospects. Two of the filly/mare offerings are daughters of our Broodmare of the Year candidates. Devil May Care (hip 159) took the Frizette Stakes (gr. I) as a juvenile last year, and returned in 2010 to annex the Mother Goose Stakes and the BetFair TVG CCA Oaks (both gr. I). A daughter of the Red Ransom mare Kelli's Ransom, Devil May Care is by Spendthrift's hot A.P. Indy son Malibu Moon. Devil May Care is a half sister to graded winner Regal Ransom, just to fill out the catalog page. Of course, Breeders' Cup might bring about a pretty substantial catalog update. If you're headed to the sale with a van, expect to commit six figures to have any shot of leading Devil May Care onto it. Another Broodmare of the Year nominee is represented by a less flashy daughter. Share a Moment ran once and didn't impress. She's had four foals, the oldest a 3-year-old that placed twice as a juvenile. So far, nothing much to excite. Race record: 1-0-0-0. Earned $320. Produce record: dam of four foals, two of racing age, one runner. Sale history: $100,000 as a 2002 Keeneland September yearling; $13,000 as a 2006 Keeneland January broodmare propect; $25,000 as a 2007 Keeneland January broodmare (IFT Teton Forest). Covering sire: Tale of the Cat. That $13,000 sale in 2006 predates a couple of important events. At that point, half brother Gio Ponti (by Tale of the Cat) was about 11 months old, and half sister Bon Jovi Girl (by Devil May Care's sire Malibu Moon) was three months from being born. Gio Ponti, of course, is reigning champion turf horse and older horse, and is approaching $5 million in lifetime earnings. He has a pair of grade I wins in 2010 that indicate he wants to defend his titles. Bon Jovi Girl has three stakes wins to her credit and is grade I-placed. The dam of these three, Chipeta Springs, also produced stakes winner and graded-placed A.P. Indy colt Fisher Pond. We're clearly looking at a modern blue hen. Current owner Eagle Valley Farm made an obvious--and I suspect commercially brilliant--choice when Share a Moment was sent to Ashford's Tale of the Cat earlier this year. The carried foal (Tale of the Cat-Share a Moment, out of Chipeta Springs) will be a close genetic relative to powerhouse Gio Ponti (Tale of the Cat-Chipeta Springs). "Typical" Tale of the Cat yearlings regularly attract six-figure bids at auction; it seems likely that her carried foal will add at least that much value to Share a Moment's final bid. 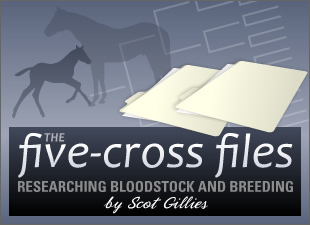 The cross, by the way, features a bold pattern of Northern Dancer/Raise a Native in 3x3 position within both the sire and the dam (making the foal a 4x4 inbreeding to same). Of academic interest--and I'll pull this nugget out again if the foal becomes a big winner--the 8-c Cherokee Rose family is shared by Storm Cat (sire of Tale of the Cat) and Pine Bluff (sire of Share a Moment). 08 November 2010: I went to see Share a Moment (Fasig-Tipton hip #148).